Probably the best upright pan mixer in the world! Our forced action mixer range is comprehensive and spans from the super-portable 40L machine, which weighs just 64kg and can mix over 90kg of material in one pan in a matter of minutes, to the mammoth 300L forced action mixer which can produce up to 700kg of material and can be used for large scale commercial mixing of concrete, screed, resin bound gravel, mortar, render and more. These durable, rugged machines have been specially designed to last the test of time in even the most demanding of conditions. 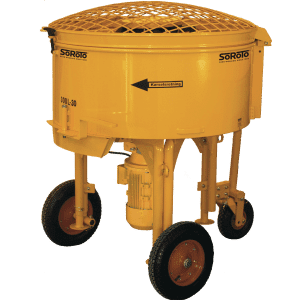 As construction sites are harsh with the presence of chemicals, salts, solvents and moisture, these upright pan mixers are manufactured to endure, regardless. 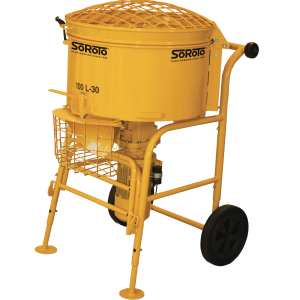 Simple to clean, safe and mobile, the entire SoRoTo forced action mixer range is sure to stay reliable, just as any good concrete mixer should. 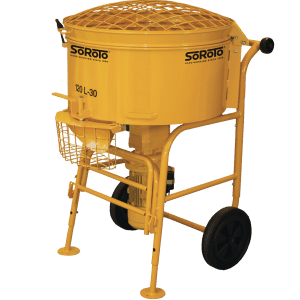 We offer the complete SoRoTo forced action upright pan mixer range on interest-free credit over terms suitable to your cashflow and business needs. With an option to spread the cost of your purchase over 3, 6, 9 or 12 months, you can ensure your payments are suitable for your business. 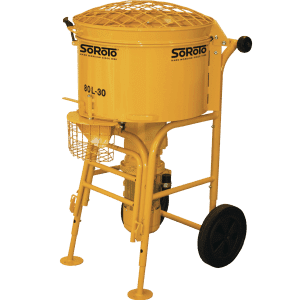 With an approval rate of 96%, 60-second application and instant decision, you could be on your way to a new SoRoTo forced action mixer in just a matter of minutes. Our credit services provider, DivideBuy, have an outstanding reputation and ensure that there are no hidden charges or fees and you can even repay your purchase early with no penalty. Check the status of your account and change your personal and contact details simply from the specially designed DivideBuy account area. Start by browsing our online shopping area, add your products to the basket and look out for the DivideBuy logo at the checkout to buy your SoRoTo mixer on interest-free credit today! We offer the complete range of SoRoTo forced action mixer spare parts, including some of the most commonly replaced parts as seen above. Whether you’re looking for a replacement switch, a new set of rubber or steel mixing blades or arms, or a complete new motor and gearbox, we can supply geniune replacement SoRoTo spare parts for your forced action mixer to anywhere in the UK, Ireland or Channel Islands. The story of SoRoTo starts in 1983 when Benny Andersen, a bricklayer at the time, made the decision to construct a mixer for himself and his colleagues for the purpose of mixing materials for tiling, flooring, concrete renovation and regular brick and stone work which was portable enough to use inside. Due to the indoor use of the forced action mixer, it was a requirement for it to fit through doors and for it to be simple to take up a staircase, as well as being suitably powered by a standard domestic output. Many forced action mixers of the day were cumbersome, difficult to handle and powered by either 3-phase current (rarely seen in domestic properties) or noisy, smoky diesel or petrol engines. In order to accomplish the requirements of his invention, Benny had to disregard any previous design and construction of the traditional mixer. Despite this, he presented his new, innovative and groundbreaking machine after only a year or two of intensive labouring. At a capacity of 40 litres, the first forced action mixer was the entire contents of a standard bag at the time and as per his original requirement, it was small enough to transport by a single man to the 4th storey and powered by standard electrical outlets. The major design innovation came through the patented mixing arms, which secured the perfect mix and could be inserted and removed from the pan with the need for any tools whatsoever and simply lifted out of the machine. The reception from industry professionals was beyond imaginable and quickly became a major breakthrough. Danish construction craftsmen however were booming at the time and very quickly required machines with a larger capacity – something which has continued to happen over the decades. 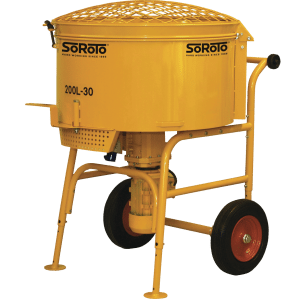 Today, SoRoTo manufacture a complete range of forced action mixers; 40L, 80L, 100L, 120L, 200L and 300L, along with a lightweight version, the 65L. Also manufacturing and distributing belt conveyors, paddle whisks and rotating-drum cement mixers amongst other to the Danish market and worldwide.